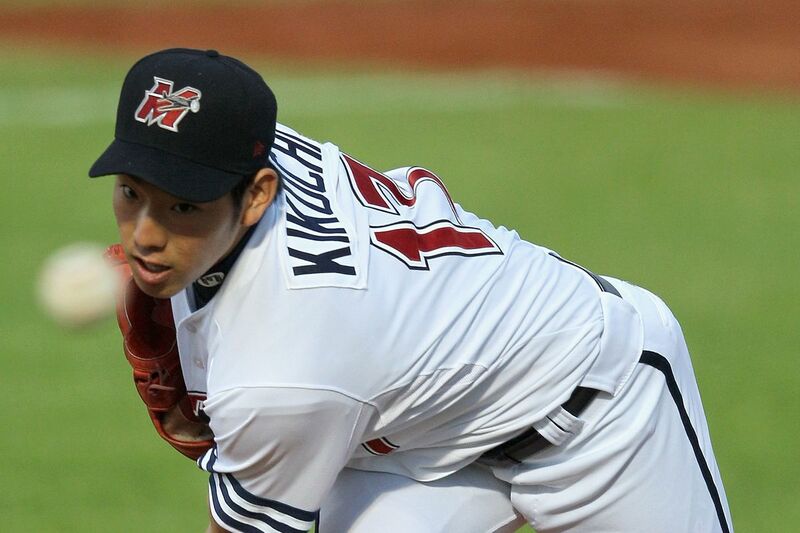 Shannon Drayer has a piece up on Kikuchi's unusual love for the American culture, among other things. For me that's a significant plus, that he loves American food, the way the American game is set up, and so forth. A comfortable player is a better bet than a disoriented one. Kikuchi had a 1+ ERA in Japan the year before last, before he ran into some shoulder pain, and an American player said the batters had "no chance." If the cautious Japanese players were overmatched by Kikuchi's change curve then you can just imagine big-swinging American players trying to face the same thing. It's not much of an exaggeration to say that this one signing saved my season for me. YouTube now has a full video of Kikuchi's first spring outing. There is a crackling curve at 6:30 and a 95 MPH fastball at 6:37. Not too much need to go through and annotate; it's an excellent video with a CF camera look at an unbroken game against the Reds. He's in ST form but the guy sure moves all of his pitches around the strike zone. His mound presence is plus. For example, watch his body language after a curve misses and compare to Paxton. Also, you gotta love the angle on his fastball. Mariners reliever Hunter Strickland is “100% ready” for Wednesday’s Tokyo opener against the Athletics after being sidelined with back issues since March 3, per MLB.com’s Greg Johns. The high-strung Strickland, now 30, will apparently get first crack at the closer’s role for the new-look Mariners, who signed the righty to a one-year, $1.3MM deal after he was non-tendered by the Giants ahead of the November 30 deadline. "High-strung" ... for those who haven't read, Strickland put himself on the DL last year by punching the wall* with his pitching hand in a blown save Godzilla tear through the locker room. En Passant my own attitude towards this is like Earl Weaver's: "It's like the golfer who misses a putt and throws his club into the water. Nobody is impressed." It's kind of like a 12-year-old trying to tell everybody it is a fluke any time he loses. Um, no, amigo, you lose sometimes because you ain't Mariano Rivera. Strickland last year had a 65-25-10 mix on his pitches, three pitches being quite unusual for a closer, and it was the first year in his career he used the third pitch. The velocities were 95 mph - 83 mph - 88 mph and the values were (loosely speaking) Even* - Even - Terrible. *Tell yer why we say that if yer wanna know. Or Edwin Diaz ... Sugar saved 57 games last year and I'd be very curious to know what his chances are of ever coming within 15-20 games of that again. His future highwater may be 42 saves, or 37. That's 70 very high-stress games per year for a young-twenties pitcher, roughly half the season. Do you think this factored in to the decision to sell high? Don't get me wrong - am not trying to cry sour grapes here. I'd give a whale of a lot to get Diaz back. But when I saw HQ's study I reacted strongly. "Wow, that's one pretty good argument to sell high."